Tiltillation is one of Dr. Crygor's microgames in WarioWare: Twisted! 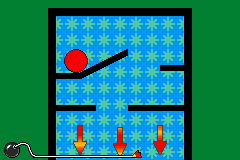 The game's purpose is to tilt the Game Boy Advance to get past the vertical maze and make the ball fall. 1st level difficulty: The maze is simple. 2nd level difficulty: The maze is a bit complicated. 3rd level difficulty: The maze is more complicated. This page was last edited on September 26, 2018, at 23:24.